Who Was Corey Hood, The U.S. Army Parachute Team Member Who Died After A Mid-Air Collision? After colliding with a fellow parachutist during the Chicago Air and Water Show on Saturday, Sgt. 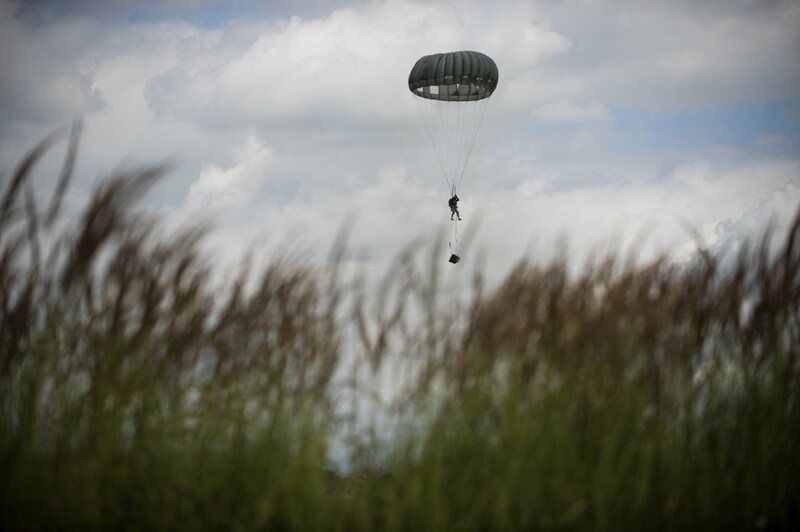 First Class and U.S. Army parachutist Corey Hood died from his injuries Sunday. Hood, of Cincinnati, Ohio, was a decorated war veteran and forward observer serving as a demonstration parachutist in the U.S. Army Golden Knights parachute team. He was 32. According to ABC 7 Chicago, the Army Golden Knights and Navy Leap Frogs parachute teams were performing a "bomb burst" — during which red smoke trail from the parachutists' packs as they separate in the sky — at the annual Lake Michigan air show when the collision occurred. Hood was taken to Northwestern Memorial Hospital where he was in critical condition until he died from his injuries. A Navy skydiver, who is stationed in Coronado, California, but whose identity has yet to be disclosed, suffered a broken leg in the collision and will likely recover, according to ABC 7 Chicago. Our focus right now is on supporting Corey’s family and grieving for our teammate. As soldiers, there are risks every day in what we do, but you do everything you can to minimize those risks and it is extremely hard when that is not enough. The Knights are a very close knit team and the military skydiving community is equally close; we will support Corey’s family and each other during this difficult time. Hood completed five tours in Iraq and Afghanistan over 14 years of service, according to his USAPT bio. He receive a number of accolades while on duty, including two Bronze Stars, two Meritorious Service Medals, five Army Commendation Medals, the Master Parachutist Badge, Pathfinder Badge, Air Assault Badge, and Combat Action Badge. His bio said he began to jump in 2010 and had logged 500 free fall jumps and 75 military static line jumps. Hood enjoyed watching sports, riding motorcycles, skydiving, and spending time with his family, his bio said. He is survived by his wife Lyndsay, according to USAPT. An investigation into the incident is ongoing.